For quite a while now, when anyone asks Big Sister E what she wants to be when she grows up, the answer has continued to be, "An artist!" I'm not completely sure where she originally learned the term or what an artist is, but okay! You go right ahead! Not being one to stifle her creativity or dreams, I try to instead offer her ways to express her artistic talents through fun, high quality ways. And when it comes to a company that is known for being a leading innovator of quality children's products that are designed to build imaginations and celebrate childhood, Step2 is always a top choice. 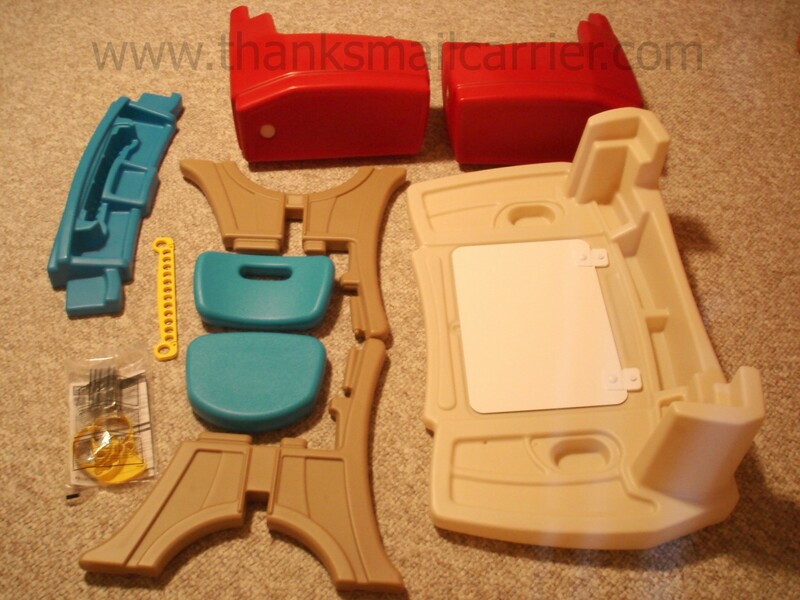 The nation's largest toddler toy manufacturer and marketer of high quality plastic products, the Step2 Company was founded on the philosophy of quality, value and service backed by a commitment to customer satisfaction. With products distributed to retailers throughout the U.S., Canada and over 70 other countries, this is one name that is recognized and known worldwide for being top-of-the-line. 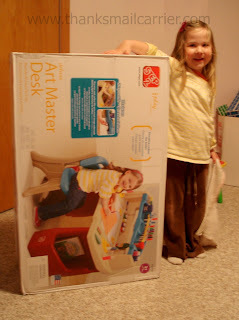 Therefore, when the Step2 Deluxe Art Master Desk arrived, I had no doubt that it would be just the thing for Big Sister E to encourage her love of art and all things crafty. 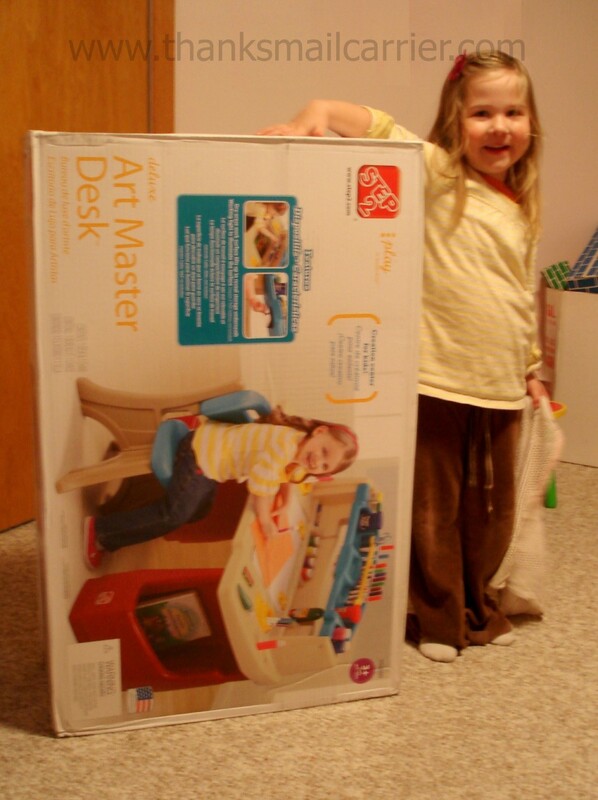 When the fairly sizable box arrived, Big Sister E couldn't wait for me to get it up to her bedroom and begin putting together her very own art desk. Laying out the pieces, I was initially concerned that the assembly for the Deluxe Art Master Desk would be time-consuming, but then I realized that there really wasn't all that much involved. A fairly intuitive process, each part of the top or legs slid into place easily and then was held there by screws. I was slightly confused by the fact that there aren't any pre-drilled holes on any of the pieces, but I managed to figure out that you just apply a little pressure and start twisting and (once they "caught") the screws went in easily. Weighing 23 pounds, it wasn't hard to slide the Deluxe Art Master Desk into a position that worked in the room and Big Sister E couldn't wait to give it a try. After admiring the large work surface and the unique hinged dry-erase writing area that covers a roomy storage space, it was clear that we needed to do was fill the molded-in compartments on the desk, raised shelf and storage bins along the sides and she would be set to create. Step2 really provided a place for everything with this Art Desk and I love that all of her art supplies, papers, books and more are within Big Sister E's reach when she sits on the cute little chair. 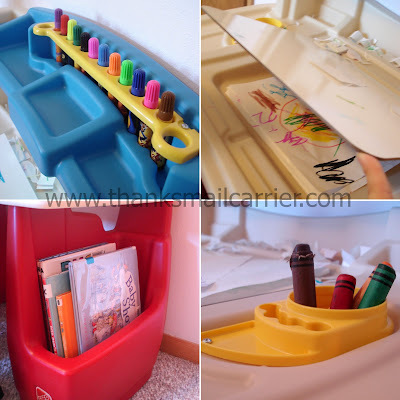 Whether she puts her markers and crayons back in the individual slots on the raised shelf or stands them in the circular holders down below, there is room for all of them, plus much more, with extra space to spare. Plus, to be sure that she can see her latest artistic creation well enough, there is an included push-button light (requires 3 AAA batteries that aren't included) that is easily accessible and child-friendly right above her work. 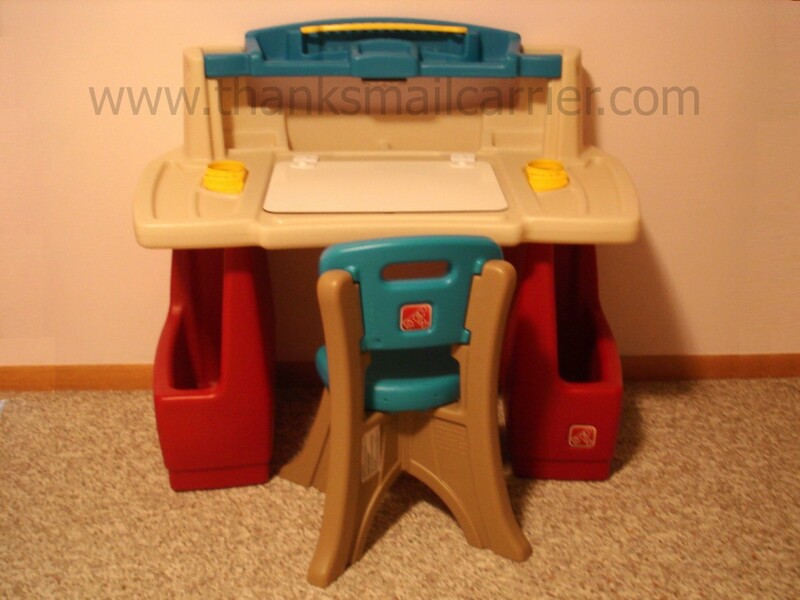 Throughout the time that Big Sister E has been using this Art Desk, it has proven to be extremely durable, very easy to clean and an overall great addition to her room. 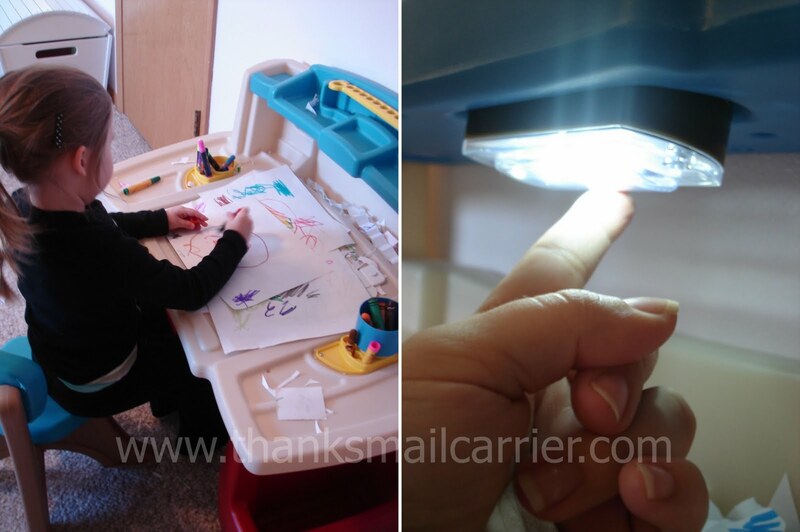 Even Little Sister B enjoys hopping into the chair and doing a little coloring every now and again and it works for her barely 2-year-old size as well... and is very cute when the two of them work together. With the large desktop surface providing plenty of room to be creative in so many different ways, the Deluxe Art Master Desk would make a perfect holiday gift for a wide range of ages and interests this season. You'll just need a bigger refrigerator to hold all of the masterpieces! Retailing for $89.99, more details and purchasing information for the Deluxe Art Master Desk (as well as any number of amazing other toys and products) from Step2 can be found on their website. You also don't want to miss connecting with them on Facebook and Twitter as well for updates, info and great deals. 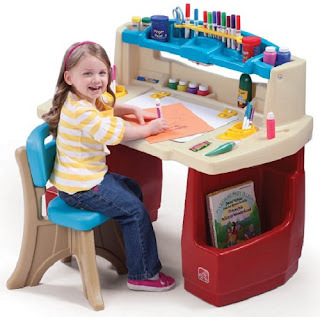 And be sure to head over to A Mom's Balancing Act for Jenna's thoughts on this great Art Desk as well! That's not all! This holiday season Step2 has set up the great Step2 Wish Book website with multiple fun things for both kids and adults. Children can write letters to Santa and make a wishlist for their favorite toys that can then be printed off, emailed or sent directly to Santa's workshop! For being such good Santa's Helpers, Step2 is also hosting a "Sweet Treat" national sweepstakes which will award randomly selected winners with Step2 gift certificates - a $1000 grand prize, a $500 second place prize and $250 for third. Who wouldn't love one of those to make their Christmas a little brighter this year? But hurry! This contest ends December 1o, 2010, so head over to the Step2 Wish Book now and enter to win! We had that roller coaster when my daughter was little and she loved it! They make great products. Step 2 has great products. I got an awesome Cyber Monday sale on a kitchen and got it for Zoe. The plastic is heavy duty and I love that! This desk looks great. I'm not really of the right stature for that desk, but I swear to you that I want it. that's so affordable for something that I know would get used everyday for several years!